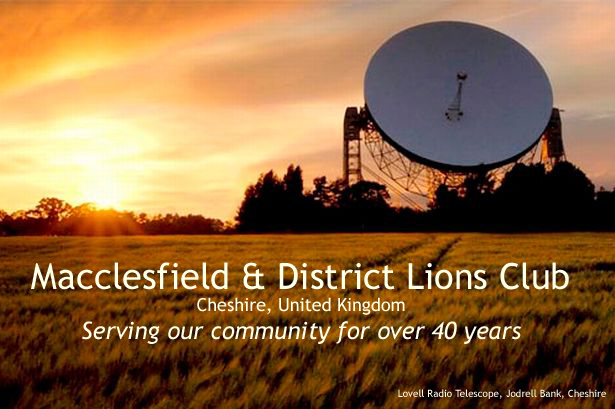 Macclesfield & District Lions Club has served the local community for over 40 years, and in a year on average we fundraise and donate over £18,000 to good causes and carry out welfare work such as distributing 200 Christmas food parcels and providing trips and parties for senior citizens. This work can only be carried out thanks to an enthusiastic membership who also have fun and enjoyment through social gatherings. Each year Macclesfield & District Lions raises over £16,000 for good causes locally, nationally and internationally and in the financial year of 2017/18 40 grants were made for a total of over £15,000, the largest being to BBC Children in Need, Middlewood Riding for the Disabled, East Cheshire Hospice, Lions Clubs International Foundation - Disaster Relief etc, Mary Sunley Canal Boat Charity, Lions Youth Brass. There were numerous other recipients and regular support given to the Bridgend Centre, Bollington. In previous years, help given to 2 schools in Bollington to help purchase defibrillators and a substantial donation made to Prestbury Park Playground. On the income side, very substantial funds were raised from the annual Swimarathon and the Bollington BikeFest. 3 members received from the Mayor of Macclesfield a Certificate of Civic Service for a Community Involvement Award and the Mayor's Civic Award Badge - see Photo Gallery. For major fundraising events, see dedicated pages - top left. Over £32m Given in the last 10 years for immediate and long-term relief in communities impacted by natural disasters.